Previously, all data in excess of the allotted plan was throttled, with options to temporarily upgrade. With the new free data, T-Mobile is selecting which companies to share its wealth of free music data: Pandora, iTunes Radio, iHeartRadio, Slacker, Spotify, Samsung’s Milk service, and Rhapsody. Note, Rdio is missing from the list. T-Mobile is throwing a bone at music lovers, but it’s a blessing and a curse since it’s only select music streaming services. New music apps will have to be spent on data packages. Legere said all music streaming services will eventually be added, but for T-Mobile, this is a non-issue since the company will be teaming up with Rhapsody to release its own music streaming app on June 22. Streaming music is awesome—until your streaming app limits your skips and makes you listen to ads.T-Mobile and Rhapsody have teamed up to give you something far better: unRadio. Listen to your favorite songs as much as you want, online and offline. Unlimited streaming of millions of songs with unlimited skips, and no ads. 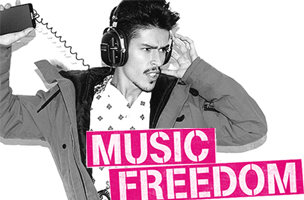 Rhapsody unRadio is included for T-Mobile customers with our newest Unlimited 4G LTE plans, and only $4 a month for all other plans. Make your music streaming awesome again. And keep it that way. Notice it’s unRadio, but not non-Rdio. Perhaps other carriers will also be joining forces with Pandora or Spotify, but Music Freedom is not going to be real Net Neutrality.